My first attempt at non-lunar astrophotography. 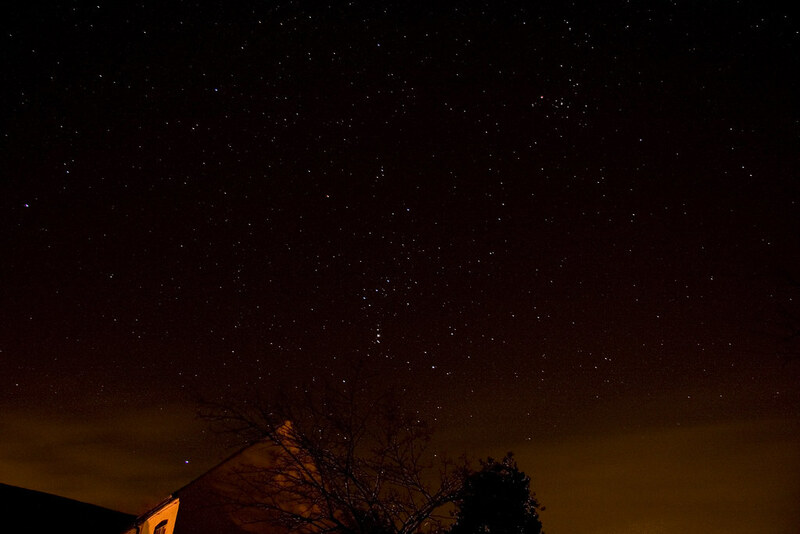 Taken in a village in Leicestershire, UK, with a 30 second exposure at f/4.5 and a focal length of 17mm (fully zoomed out on the Canon 17/85). I've never been able to see Orion's nebula with the telescope I bought when I was 13 as well as I can with this long exposure on the camera. If the rain ever leaves Santiago again I'll head out to the countryside to try some more shots. (The highlights in the tree are simply where I attempted to brighten the highlights and caught a few spots I didn't want to) Another shot here which includes an airoplane trail streaking past the Pleides, sadly not a comet. there are still stars in the night sky??? you're joking! stars and more it seems!